You might think that celery is just one of those plain-Jane foods that you find on a veggie platter or sticking out of your Bloody Mary. And because celery is emblematic of dieting, you probably wouldn’t be surprised to learn that a five-inch stalk has just three calories. But did you know that for those three calories, you also get a whole lot of nutrition? High in fiber, bulked up with lots of zero-calorie water plus a nice dose of disease-fighting antioxidant phytonutrients, vitamins K, C and A, folate and potassium, this fabulous, crunchy, super-low-calorie food deserves a second look—even if you’re not dieting. Research suggests that the powerful antioxidants in celery help the body fight off heart disease (by lowering blood pressure)…boost immune function…and lower inflammation. • Fact #1: Calories do count. Some people claim that celery is a “negative-calorie food”—a term that means you will burn more calories digesting celery than it contains, for a net loss. This sounds plausible—in theory—but in reality, even the lowest calorie foods, such as celery, grapefruit and cucumber, still contain more calories than it takes to break down and absorb them in the body. • Fact #2: Celery juice is not a cure-all. Search social media for #celeryjuice, and you will be inundated with gorgeous photos of what is often touted as a miracle green elixir, a drink capable of curing everything from eczema and infertility to cancer and even mental illness. The problem is, there is no scientific data supporting these claims. Plus, when you juice a lot of celery, you concentrate the vegetable, so it’s going to be higher in sugars, carbohydrates and calories. With the juicing process, you also strip away the beneficial fiber—the very substance that helps you feel fuller longer, improves your intestinal health and feeds the healthy bacteria in your gut. • Fact #3: Raw is best. Celery often is eaten raw—and for good reason. 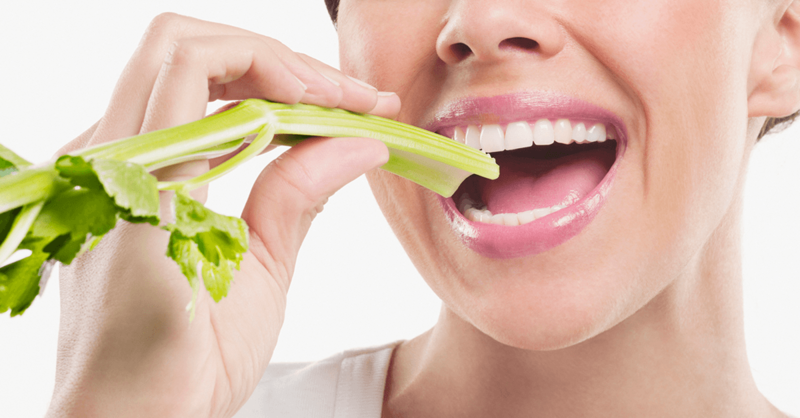 Blanching or boiling celery causes a significant loss of antioxidants, according to research. When eaten raw (or steamed), celery retains almost all the antioxidants. It’s time to get creative: Celery makes a great addition to almost all salads, and it definitely adds some crunch and pizzazz to the mouthwatering salad recipe below! Directions: Cook couscous according to package directions. Remove from heat and let cool. Zest the orange peel, and juice the orange. In a small bowl, whisk together one tablespoon orange zest, juice from the orange, extra-virgin olive oil, white wine vinegar, salt and pepper for the dressing. In a salad bowl, mix together the couscous, celery and grapes. Toss in the dressing and serve. Makes two servings. Nutritional information per serving: Calories, 250…fat, 15 g…cholesterol, 0 mg…carbohydrates, 46 g…dietary fiber, 2 g… total sugars, 21 g…added sugars, 0 g…protein, 6 g…sodium, 35 mg.